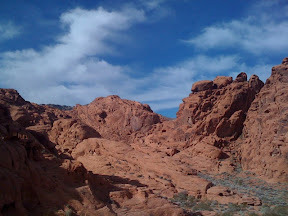 The Valley of Fire is in Nevada just an hour north east of Las Vegas. It's a great place for family camping. 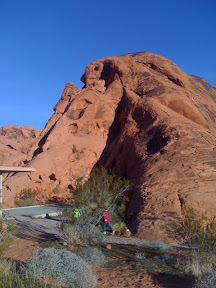 With the location so close to Vegas you could have a weekend getaway or just take a day trip to let the kids climb and do some hiking. 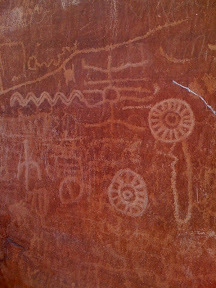 Valley of Fire fun fact - it was Nevada's very first state park. 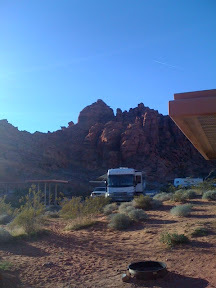 They have places for tent camping and lots of rv spaces some with hook ups. It's first come, no reservations. Every site has a fire pit. Camp fires are allowed. 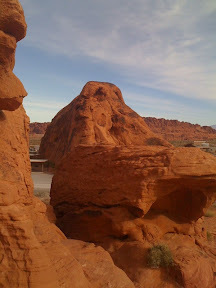 There are huge beautiful rocks every where. There is wild life including this big horn sheep that walked by. 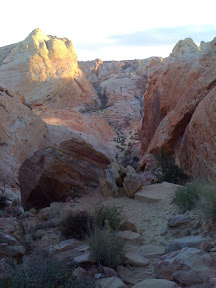 There are hiking trails all over the state park. 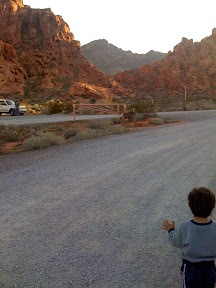 Many of the hikes are kid friendly. 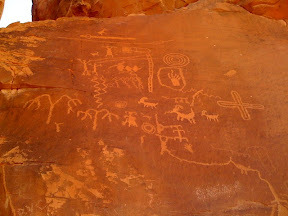 You can see petroglyphs at various locations throughout the park. They have a small visitors center with information on all aspects of park. It's a great educational opportunity for kids. Here are some more military discounts. Some of these are repeats from my earlier list. Please see my military discount label to see all discounts that may be available to you. Anheuser – Busch Amusement Parks – Free admission for you and your family into one some of their parks including Sea World and Busch Gardens. Take a valid military ID with you. Banana Republic – 10% military discount 1st of every month (may vary by location; in-store only). Barnes and Noble – 6% off regular price plus free shipping, check out www.bn.com/militarycity Barnhill’s Buffet – Discount varies, simply ask and have a valid military ID with you. Clarion Inn – Rates within allowable per diem while on travel orders. Disney World - varies every year and it is usually a substantial discount. Marriott Hotels – It’s the Per Diem amount the government picks up, whatever that amount is. Just call and place the reservation over the phone and ask for that discount. Midas – 10% off MLB Hall of Fame – Discount varies, simply ask and have a valid military ID with you. Nickelodeon Hotels – Reduced rates and perks, online and in store, www.nickhotel.com/military , 877-NICK-111 877-NICK-111 and ask for the Military Family Package. Nuvo - $30 off Ritmo Pregnancy Sound System. You can call 1-888-688-6462 1-888-688-6462 , or use coupon code MILITARY99 online at http://www.nuvo-group.com. Valid military ID required for in-store purchase. S & K Men’s Wear – 8% Discount on all items free shipping on orders over $99 & APO/FPO shipping. To access the military site at S&K you must go through their AAFES Exchange Mail Online service. Sally Beauty Supply – Discount varies, simply ask and have a valid military ID with you. Sleep Inn - Rates at or below per diem depending on location. Discounts may vary and depend on availability. Southwest Airlines – Varies, it’s a dollar amount, not a percentage. Not available on all flights, you’ll have to call Southwest and simply just ask. Texas Road House – 10% military discount Texas Roadhouse – Discount varies, simply ask and have a valid military ID with you. Yea! I just won a Stylish Blogger Award from Anne at 500 Places With Kids Thank you so much!!! My husband just deployed a week ago and this really brightened my week. 3. Award 15 recently discovered great bloggers! 1. I've been an Air Force wife for 10 1/2 years. 2. I'm addicted to Sonic drinks. My favorite is a cherry vanilla Dr. Pepper with cream. 3. I hope to move back to Portland, Oregon someday. We were blessed to live there for almost 3 years and I fell in love with the Pacific Northwest. 4. My two greatest achievements are my 3 children and getting my college degree. 5. House boating is my favorite family vacation with going to the beach a close second. 6. I've been working on my blog for over two years. 7. I wish I was a better writer. 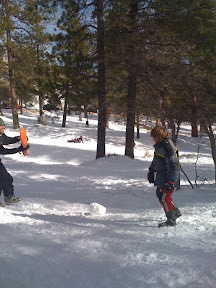 Just because you live in Vegas doesn't mean you have to miss out on snow. 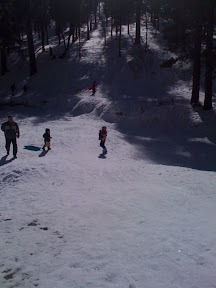 Mt Charleston is not that far away. There's tons of snow up there and it's only a forty five minute drive for Las Vegas. At the top of Mt. Charleston is a ski resort. 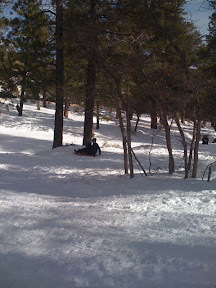 If your not sure where to go sledding near Vegas, I suggest packing up your sled and heading towards Mt. Charleston lodge. Drive until there is enough snow to sled on. 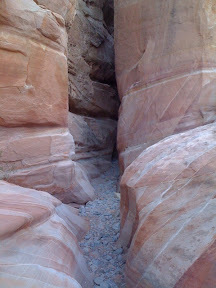 These pictures are near Kyle canyon campground just a few mintues from the Mt. Charleston lodge.